After a pre-flight briefing during which you can discuss the route taken, you will be taken out to the helicopter. Once airborne from Blackpool airport you will fly up the promenade, past Blackpool Pleasure Beach, over the three piers, past Blackpool Tower and over the River Wyre. 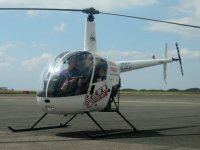 Then it will be time to return to the airfield to try your hand at hovering - it is not as easy as you think! Spectators will be made very welcome. They can look around and have their pictures taken in the helicopter! They can wait for you in the comfort of our lounge where they will also be able to watch their friend or loved one taking off, hovering and landing. At the end of the flight the participant will be presented with a certificate signed by the instructor. Once booked you will be asked to contact us on the day of the flight to see if the weather is suitable. If it is not suitable we will be able to re-book the flight for another day.